Someone wants Skye Hunter’s son, Tyler, and they’re willing to kill to get him. On the run for her life, Skye turns to the only person she believes can help her—a complete stranger with a shared past. David Bishop thinks Skye is crazy. But when he realizes she has the same strange phenomenon inside her body that he does—the ability to move objects with her mind, David is forced to question his life, his childhood and his father’s motives. Can these two lost souls uncover the mystery of their telekinetic powers and save Tyler and themselves in the process? A very fast-paced book with lots of mystery in it that drags the reader into the story from the very first pages. 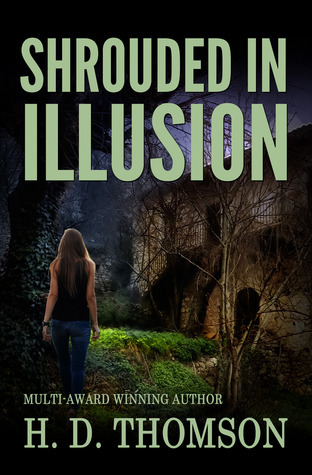 "Shrouded in Illusion" is the third book in a series but it can totally be read as a stand-alone since the plot is centred around different characters. Skye is a strong, independent woman who will fight anything and everyone for the safety of her nine-years-old son, Tyler. While reading I put myself in Skye's shoes and I started worrying for her little man like he was mine, so the anxiety grew stronger and stronger in me, especially after an event that I can only imagine hard to digest (if that is even possible) for a mother. Thank God for David who kept me from sighing, just with anxiety at least. I enjoyed the crescendo of his feelings and the fact he's not ready to jump into 'bizarre situations' without hesitation, but I may not have enjoyed so much all David/Skye moments together. Perhaps because in a certain situation I wouldn't have thought about a particular 'distraction' at all... But I do think those two are a good match. I wish there would have been the possibility to have more answers about the powers and the whys around them, but overall it was a good read that I'd recommend especially to those who like a thriller with paranormal elements and quite unexpected twists.